Ahead of a United Nations high-level event on antimicrobial resistance to be held next week, a senior UN health official today underlined the need for strong commitment from all sectors to address this urgent global threat which has the potential to undermine sustainable development. “The emergence of antimicrobial resistance really threatens to send us backwards – to have infections once again become a much larger killer of people,” Assistant Director-General of the UN World Health Organization (WHO) and Special Representative for Antimicrobial Resistance Keiji Fukuda told a news briefing today at UN Headquarters in New York. “By 2050, estimates indicate more people could die from antibiotic resistant infections than those who currently from cancer. This is a surprising comparison, this means that almost 10 million people would die from infections because they those couldn’t be treated anymore,” he added. The High-Level Meeting on Antimicrobial Resistance, convened by the President of the UN General Assembly, WHO and the UN Food and Agricultural Organization (FAO), will be held on 21 September on the side-lines of the high-level segment of the Assembly’s 71st session. In his briefing today, Mr. Fukuda also highlighted that the economic cost of such a scenario would also be staggering, and warned that the cumulative economic loss on having to take care of people suffering from such infections and possible subsequent deaths could exceed $100 trillion by 2050. “This is in the order 2 to 3.5 per cent of the global [gross domestic product], enough to send countries backward, particularly those that are in precarious economic conditions,” he said, noting that, even more importantly, it would hamper medical and health systems from being able to take care of and treat people. 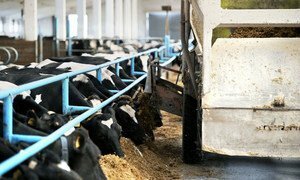 Furthermore, noting that sustainable food supplies depend heavily on antibiotics because they are used to treat sick animals and to prevent the spread of diseases, he said that with rising global populations, availability of food to feed everyone would depend heavily on the efficacy of antibiotics. Mr. Fukuda stressed that eroding healthcare and the inability to feed people, compounded by enormous economic cost, could potentially take away countries’ ability to continue with development, in particular sustainable development. By discussing antimicrobial resistance next week at the high-level meeting, the senior UN official said that Heads of State and Government would send a very visible sign that they understand the gravity of the situation and that they are committed to addressing it. Through a political commitment on the issue, the meeting will help facilitate concrete coordination among different sectors and help implement it in practice, he added. The event will also help secure the engagement and support of multiple sectors which are vital to address such a complex, global challenge, said Mr. Fukuda.